At the fashion show they are hosting a cool game of shooter! 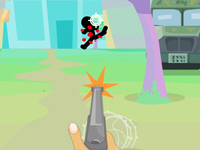 Take control of the gun and shoot the annoying little stick men that appear from around the corners of the game. Make sure you reload otherwise you may run out of ammo! You can't dress up for the fashion show until you shoot the bad guys.